Baseball Reference lists J. Efird, a pitcher in the Virginia League and Southern Association from 1911-1915. Jasper Jerome “Jap” Efird was born December 30, 1890 in Albemarle, North Carolina. 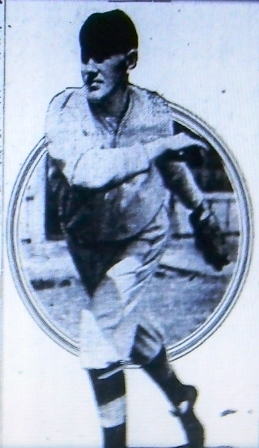 Efird was a star pitcher for Washington and Lee University; his brother Walter Guy “Watt” Efird was the team’s catcher. After leaving Washington and Lee Efrid signed with the Roanoke Tigers in the Virginia League. The righthander won 70 games lost 37 for Roanoke from 1911-1913, including a 28-13 record in ’13. In 1912 Efird won the final game of the season against the Petersburg Goobers giving Roanoke the league championship. In February of 1914 the Atlanta Crackers of the Southern Association purchased Efird’s contract. Before the season began Efird developed a sore arm and suffered from other ailments that limited to 6 appearances with Atlanta. On May 24 Efird’s contract was sold back to Roanoke. Efird won 13 games for Roanoke in 1914 and posting an 18-11 record the following season for the Tigers, relocated to Suffolk, Virginia for the 1915 season. Despite the respectable showing upon returning to the Virginia League, he never fully recovered from the arm problems and his career ended after the ’15 season, with a career 103-61 mark. Efird returned to Albemarle where he passed away on May 27, 1935.